A bank of centrifuges at Iran's Natanz enrichment facility. Israeli Prime Minister Benjamin Netanyahu faced a daunting task at his address to Congress this week: convincing a friendly America, but a hostile administration, not to let Iran acquire an atomic bomb that could undermine the West and destroy Israel. His speech to Congress was so effective not only because of his characteristically superb presentation, but because he -- contrary to claims by critics -- presented concrete suggestions for a better deal. He was also pragmatic enough to say that Israel could live with a better deal despite the fact that it would not entirely remove its justified fears. Netanyahu's speech was necessary because after years of deliberations and the analysis of the mortal danger posed by Iran, too many decision makers and pundits still do not understand why Iran is seeking to acquire an atom bomb with such determination and at such great cost to its economy and international standing. Indeed, it continues to pursue nuclear weapons despite the fact that it is at the brink of economic collapse due to the steep fall in the price of oil. Why would the Iranian leadership risk losing its power unless it considers the acquisition of a nuclear bomb vital to its survival? Many still do not understand why Iran is seeking to acquire an atom bomb at such great cost to its economy and international standing. Iran's has two interrelated strategic goals: one religious, and the other economic. The religious goal is to vanquish the "Great Satan," America, which, with Europe, is the bastion of Christianity. The fanatical Mullahs who rule Iran consider Christianity (and all non-Islamic faiths) as heresies that must be eradicated. Their hatred of Israel is inflamed by a conviction that it is America's most formidable Mideast ally, a willing tool of America's "crusader" incursion into holy Islamic land. Iran is dependent on the high price of oil for its survival. Its second goal is therefore to increase the price of oil. After the 1979 Islamic revolution, Khomeini slapped stringent price controls on agricultural products, destroying Iran's agricultural industry, which had once been a powerhouse. Millions of impoverished farmers moved to shantytowns abutting major cities. They were sustained by "Islamic charity," financed by the Shah's confiscated assets. Aid was dispensed according to family size, so the birth rate soon skyrocketed. Iran is now forced to support more than 70 million destitute citizens, many of whom are unemployed -- 25% of families have no working member. Iran also suffers from high inflation, estimated at over 30% annually. Its welfare bill consumes almost its entire income from oil, 30% of its GDP. 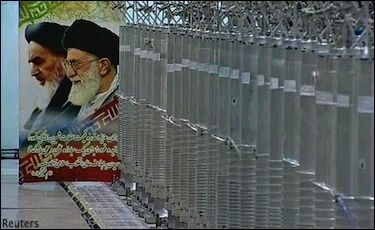 Iran financed Hezbollah and Hamas with hundreds of millions of dollars annually not just to kill a few dozen Israelis. There was an economic logic as well: its clients launched major terrorist attacks whenever oil prices fell, catapulting oil prices higher: an excellent return on Iran's investment. Higher oil prices will foot the regime's welfare bills, cover its atomic and missile development projects, and help spread the Islamic revolution through global terrorist networks. Furthermore, Iran's huge financial clout can easily be translated to political pressure that will make economically troubled Europe even more cooperative. (Consider the clout that Vladimir Putin holds over certain European nations that depend on Russian natural gas.) Iran's clout could prevent European governments from effectively resisting the multitude of radical Islamists in its midst. The recent fall in the price of oil may foil Iranian plans. But as long as Iran is so dependent on a higher price for oil it can be assumed it will try in every possible way -- including a wave of terrorist attacks -- wherever they see an opportunity to sow anxiety about the availability of an adequate supply of oil, and thus raise its price. With the help of an atomic bomb, Iran will not only foment a clash of cultures, its will try to make the West crash. Iran's incitement against Israel and its repeated threats to destroy it also serve to distract Sunni Arab attention from its plan to take over Saudi Arabia, so that it can control the price of oil and take possession of Islam's holy places. Shiites are the majority in Saudia's Dhahran oil producing province. Possession of Islam's holy places will make Shiites a dominant force in Islam. By riling the Arabs against Israel, Iran also hopes to unite Muslims worldwide in a Shiite jihad against the West. After the 1973 Yom Kippur War, OPEC, controlled by Arab oil producers, declared an oil embargo against Western countries they accused of helping Israel. The embargo caused the price of oil to rise from $3 dollars a barrel to $12. The Shah also raised the price of oil. There are many indications that the Mullahs are hoping that by blocking the Straits of Hormuz, they can cause the price of oil to skyrocket once again. They have already taken possession of the two tiny islands in the Straits of Hormuz that control the passage through them, and placed on them silkworm ground to sea missiles that, together with the mining of the straits, could block passage. They have held several exercises simulating a Western attempt to lift the blockade and how Iran could foil it. The Iranians have also established bases in the horn of Africa to prevent American reinforcements from helping to break the blockade. A blockade will enable Iran, the Mullahs hope, to initially demand a small passage fee, which they will incrementally increase. No one would go to war with a nuclear Iran about small increases. Eventually, Iran hopes to gain in its favor a huge transfer of wealth from Western countries. It will make Europe economically and politically dependent, unable to resist Iranian demands, including a trade boycott of Israel that could ruin the Jewish state's economy. Netanyahu focused on Iran as the greatest threat to world peace. But as the recent targeted killing of an Iranian and Hezbollah high command mission in the Syrian Golan suggests Iran is also making a serious effort to encircle Israel on its north. If President Obama succeeds in establishing a Palestinian state, it will immediately be taken over by Hamas. Look what happened in Gaza. Hamas will then launch missile attacks against Israel's heart. Israel will have no option but to conquer the West Bank, a densely populated area, in bloody battles that will kill and injure tens of thousands of Israelis and Arabs. The remaining Arabs would flee to Jordan, toppling its regime, replacing it with an Iranian protectorate. An atomic Iran could make life hell for an encircled Israel, with Hezbollah and the Syrian Golan an Iranian base on the north, Hamas on the west, and an Iranian protectorate to the east. Iran is also obviously preparing to recapture what they consider "stolen holy Muslim land". "Peace in our time" indeed.